Started on the second Bowie. This is up to 100 grit. Holy crap man!! what do you grind in your sleep. Lol. What are you planning on for the guard and handle? Ha! I do wake up thinking about it! I haven't decided yet. 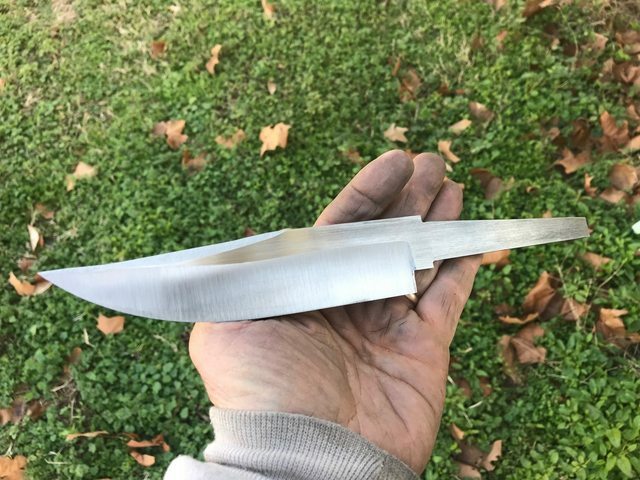 I really like the 1/8" stock I used for the last Bowie, but thinking a thicker guard might look better on this knife since it's longer and thicker. I have some nice blocks of stabilized wood, but I haven't picked out any thing yet. Or I may go with antler again. What do you think/suggest? Very nice. Do you sleep? Take a break to eat. Where do you find the time to make all the nice knives? You probably have a beer while watching FIF then go back to work. Thank you! I just have a passion for it and I work way to fast. But I’m kind of OCD that way. I haven't decided yet. 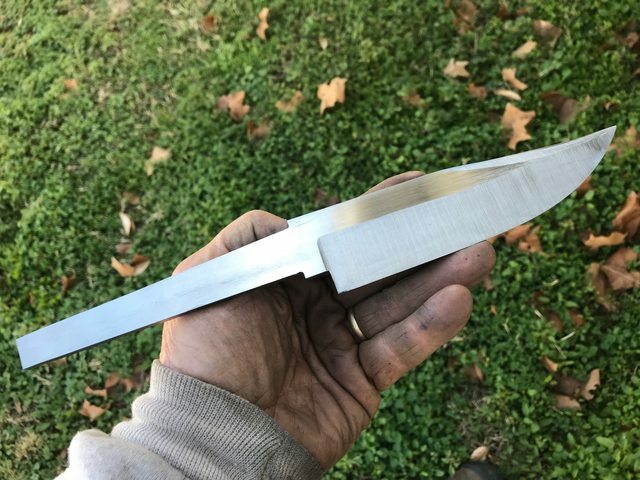 I really like the 1/8" stock I used for the last Bowie, but thinking a thicker guard might look better on this knife since it's longer and thicker. I have some nice blocks of stabilized wood, but I haven't picked out any think yet. Or I may go with antler again. What do you think/suggest? I think it would look good with like a oval guard like 1/8 inch thick piece of "steel" and then a spacer behind that the same length as the ricasso if you get what I mean. Then I would make either a sculpted wood or stag handle with some kind of metal but cap or I would make it a coffin still handle. And the spacer ( some say ferrule but its not a ferrule unless the wood or whatever goes inside it) could be 1 piece of metal or like a package deal of 3 diff types of metals, like bronze, same material as the guard , and another piece of bronze. Also with the oval guard some people center on the knife some people off sett it down on the knife. I hate when it is centered on the knife I think it makes the knife look like it is wearing a satellite dish. Lol. I think it looks good when you leave as much above the spine as you do below the cutting edge. But take all this with a grain off salt because I have never built a Bowie I will soon though because I have to get all these ideas out of my head before I go nutssssssss. Lol. I do stare and drool at Bowies everyday all day on the screen. I does and I appreciate the feedback. I actually put a think spacer behind the Bowie guard in the first knife. I used maroon and should have used a bright red because it didn't show up very well. I'm beginning to think Bowie knives are like Hamon's, they are addicting. Also it is quite interesting to google Bowie Images and see the plethora of all the shapes and styles. Have you seen John Wayne in The Alamo. There's not much left of the real Alamo. John spent his own money and had the movie Alamo made to everything known about the real one. Good show. The knife was lost at that massacre. Took about 2.3 minutes. Taken and handed down. Who knows. Keep making them. You do a good job! The best thing about making bowies is that there is no cut and dried, right or wrong, one size fits all way to make them, so our own personal take is as right as the next makers. I have done a 1/2 dozen of them and have another on the bench at the moment but with the copper bolster rather than a guard as that was what was asked for. I agree to a certain point but I guess it depends on the parameters set around a Bowie vs a large knife; traditional vs more modern interpretations. I’ve seen images of knives called ‘Bowies’ but without certain elements, to me they look like large knives. But this is just my opinion about the concept. Its funny, I make a lot of 'guardless' bowies, but I hear a lot of people say that a bowie NEEDS a guard. I like bowies with guards too and that seems to be the overwhelming consensus. The funny part is.........by all accounts (that I know of) the original sandbar 'bowie' was a large, guardless knife nearly identical in profile to a huge French butcher knife.........not at all what most call a bowie today. The funny part is.........by all accounts (that I know of) the original sandbar 'bowie' was a large, guardless knife nearly identical in profile to a huge French chef's knife.........not at all what most call a bowie today. That's funny Doyle in that the accounts I read about the sandbar fight described the Jim Bowies knife as a large butcher knife! I guess this is where the intrigue lies. I was reading older posts from another forum and there are two pages of different opinions on what is and what makes a Bowie. And then there are the gentleman's Bowies...…………………..
Now only if we could get Marty McFly to help us.